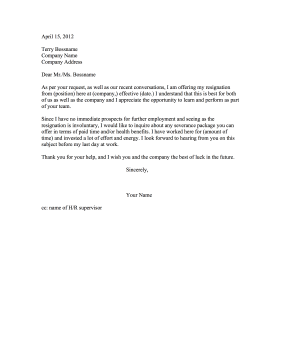 After a forced resignation in lieu of discharge, this resignation letter requests a severance package. As per your request, as well as our recent conversations, I am offering my resignation from (position) here at (company,) effective (date.) I understand that this is best for both of us as well as the company and I appreciate the opportunity to learn and perform as part of your team. Since I have no immediate prospects for further employment and seeing as the resignation is involuntary, I would like to inquire about any severance package you can offer in terms of paid time and/or health benefits. I have worked here for (amount of time) and invested a lot of effort and energy. I look forward to hearing from you on this subject before my last day at work. Thank you for your help, and I wish you and the company the best of luck in the future.